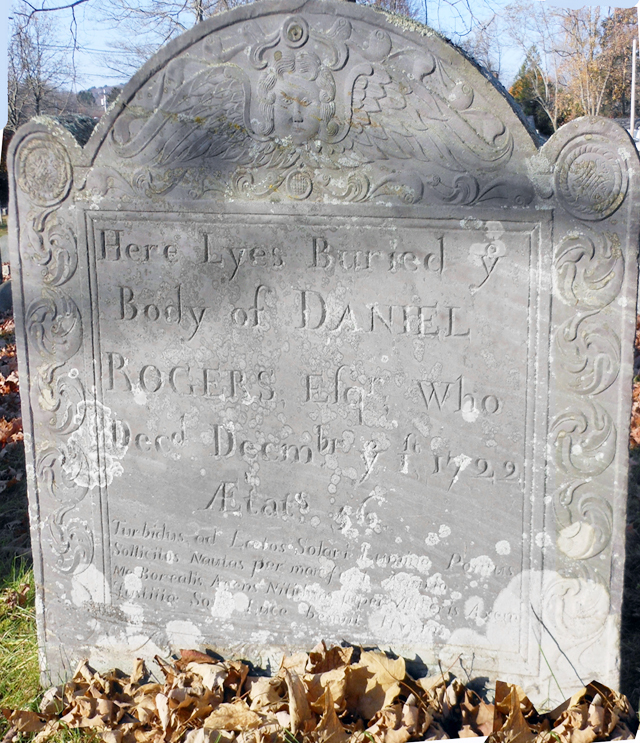 Daniel Rogers, born in 1667, was the son of President John Rogers of Harvard and Elizabeth Dennison, daughter of Gen. Daniel Denison, a distinguished and much honored leader of Ipswich. he graduated from Harvard in 1686 in his nineteenth year and first became the teacher of the Ipswich Grammar School. Fifteen of his students at the Grammar School subsequently entered Harvard College. In 1702 he was admitted to practice law in the Ipswich Court. Rogers’ associate in the practise of law was Captain John Appleton (2), who married Roger’s sister Elizabeth (2). Rogers married Sarah, daughter of Col. John Appleton (1), and they had eleven children. In Ipswich Daniel Rogers served as the Register of Probate and later as Justice of the Court of Sessions, Town Clerk, and was one of the feoffees of the Grammar School. On the cold wintry afternoon of December 1, 1722, Daniel Rogers was returning to Ipswich from a court case in Hampton, got lost on his way to the ferry that crossed over the Merrimac, and took a wrong turn that led deep into Salisbury marshes. Nighttime came upon him, and becoming increasingly bewildered and frightened, he called twice at the only house, asking for guidance to the ferry. Daniel Rogers never returned home, and his body was found a few days later near Salisbury beach. Suspicion fell on one Moses Gatchel who lived in the house upon which Rogers had called in desperation. Gatchel had a bad reputation, and it was suspected that he had robbed and murdered Rogers. Gatchel admitted that Rogers had come to his home, and was even seen riding Rogers’s horse a few days after its owner was missing. He was arrested on suspicion and an investigation ensued, but no charges or indictment were filed, there being a lack of solid evidence. In 1731, we find Moses Gatchel residing in Topsham, ME. Daniel Rogers’ body was brought home and he was laid to rest in the Old North Burial Ground in Ipswich. blessed me with the light of the Sun of Righteousness. Did John Appleton have a ‘first’ wife, and children by her? If John Appleton married Daniel Rogers sister, Elizabeth, then Daniel married one John Appleton’s daughters – wouldn’t that be his neice? I added (1) and (2) to indicate there is a mother and daughter both named Elizabeth, and the father and son both named John Appleton. Thank you for presenting various subjects of Ipswich history. As a former Town Historian in Dracut, there is a an Interesting connection between the towns through the Shatswell Family that relates to the settlement of our town. When time permits, I will forward that information.